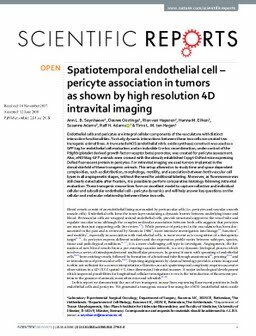 Endothelial cells and pericytes are integral cellular components of the vasculature with distinct interactive functionalities. To study dynamic interactions between these two cells we created two transgenic animal lines. A truncated eNOS (endothelial nitric oxide synthase) construct was used as a GFP tag for endothelial cell evaluation and an inducible Cre-lox recombination, under control of the Pdgfrb (platelet derived growth factor receptor beta) promoter, was created for pericyte assessment. Also, eNOStag-GFP animals were crossed with the already established Cspg4-DsRed mice expressing DsRed fluorescent protein in pericytes. For intravital imaging we used tumors implanted in the dorsal skinfold of these transgenic animals. This setup allowed us to study time and space dependent complexities, such as distribution, morphology, motility, and association between both vascular cell types in all angiogenetic stages, without the need for additional labeling. Moreover, as fluorescence was still clearly detectable after fixation, it is possible to perform comparative histology following intravital evaluation. These transgenic mouse lines form an excellent model to capture collective and individual cellular and subcellular endothelial cell-pericyte dynamics and will help answer key questions on the cellular and molecular relationship between these two cells.